Repair/replace duct work to the living room area. There are 2 registers that are not blowing air. I went underneath the house and found that the ductwork has been severed by an animal some time earlier. Would like for the ductwork to be repaired if possible. Would like to get a quote on a new hvac system. If your furnace won't turn on, if there's a leak, if the blower isn't working or if you want regularly scheduled maintenance, you are in the right place! Comfort Services, Inc. has a dedicated and devoted team of furnace service professionals with decades of combined experience. Our trained technicians can provide a prompt and thorough inspection of your unit to determine the problem and suggest the solution. Our furnace service team provides FREE written estimate for all potential furnace repairs so you will never be surprised by the bill. Also, we provide furnace service for all types and models, including natural gas, oil, electric and propane. Don’t hesitate to contact us today, call or click to schedule your furnace service appointment with Comfort Services, Inc.! If your furnace is old or your bills seem too high replacing your furnace will be the best option. Major problems compromise the unit over time and keeping a damaged or old furnace may be costing you more money than installing a new unit. Our certified and highly trained team of furnace installation professionals can provide a thorough inspection of your unit to help you make that decision. Our skilled experts can replace all types of units with high-quality and energy efficient models that are guaranteed to lower your energy bills by as much as 30%. Trust our furnace installation professionals to provide you with reliable services every step of the way. Call or click today to schedule your FREE furnace installation estimate! Crawl spaces tend to soak up the natural cold or heat around your home and transfers it into the air in your crawl space. This will cause your energy bills to rise and your home’s comfort to decrease. If you have utilities in your crawl space such as your water heater, furnace, or hot water pipes, your energy bills will suffer even more. The fluctuation in temperature will force your heating and air conditioning systems to work harder, causing your energy costs to rise. For your crawl space insulation to perform like it should, it's essential to install the right type of crawl space insulation, the right amount of crawl space insulation, and use the correct installation technique. At Comfort Services, Inc. we can improve the condition of your crawl space with products that are durable, long-lasting, and made especially for the crawl space environment! Blown-in insulation is one of the most cost-effective ways to ensure your home is energy-efficient. Blown-in insulation, which is sometimes referred to as “blow-in” or “blown” insulation is very convenient because, well, it is blown from a tube. Due to its unique application, it can quickly be installed in almost any space. Blown-in insulation provides excellent insulation value and can reduce heating and cooling costs by as much as 40%. 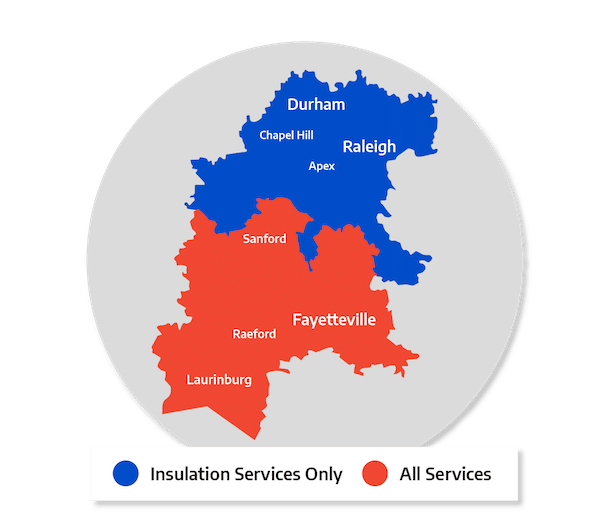 Contact us today to schedule a FREE blown-in insulation estimate! Here at Comfort Services, Inc., our skilled technicians can inspect your air conditioning system and provide the right services to prolong the life of your cooling system and keep your home comfortable. We provide repair and maintenance services for all brands and models of central and ductless air conditioners. © 2019 Comfort Services, Inc.